Brian O'Rourke's family didn't have much money. They needed many things, but couldn't afford them. Brian's father needed a bicycle so he could ride to work and not have to walk the eight miles to town in the morning and back home in the evening. Grandmother O'Rourke needed some electric lamps to read by, for her old eyes weren't as good as they once had been and she need plenty of light. Brian's mother, Maureen, needed a gas stove so she wouldn't get so sooty every time she cooked. Brian and his sister Kathleen both needed new clothes. Their old ones had so many patches almost none of the original material was left. Things had gotten so bad that the landlord came to see Mr. O'Rourke. "Ian," he began, "you know that I am a pretty reasonable man. But you have not paid your rent in seven months. I can give you just one more month. If you haven't paid up by then, I'm afraid you'll have to go. I have my own bills to pay, you know." "I understand," said Ian. "We'll try to raise the money by next month." When he reported all this to the children their eyebrows raised in disbelief. "He can't do this to us!" they cried. "Where shall we live?" "He can do it," Ian told them as gently as he could. "God will take care of us, so you are not to worry. But please, don't make anything harder than it already is for your mother and me. Now, dry your tears, my children. Our month is not up yet!" It was a week later, on St. Patrick's Day, that Brian was climbing a very rocky hill that bordered one of the landlord's fields. Suddenly, he felt the rocks underneath his feet giving way! The next thing he knew he was falling, and was being pummeled by the falling rocks. One of them hit the back of his neck and he blacked out. The sound was like a mist in the fog in Brian's brain. He got to his feet and, rubbing the back of his neck, looked around him. Here and there rocks cluttered an otherwise level floor. He seemed to be in a large cavern or subterranean tunnel. "Sure, and yer very observant," growled the little creature. "And it'd do ye well to help get me out of this predicament!" "What happened?" asked Brian, as he struggled to remove the one large rock that was imprisoning the leprechaun. "I was just walkin' here in my cave," the little man replied, "when the roof started cavin' in for no reason a-tall. I started runnin' but the boulder was too fast for me—crashed down and smashed my leg, it did. Fortunately it didn't touch me anywhere else." Brian finally lifted the boulder high enough for the leprechaun—who said his name was Paddy—to slide out from under it. Immediately Paddy jumped up and tried to run away but his effort ended with a scream of agony. The leprechaun had broken his leg. Brian was an Irish Boy Scout, and he knew how to apply a splint to a broken leg. He chose two branches that had also fallen into the cave for splints, and used his own worn jacket for padding on one, and his shirt for the padding of the other. "You'll have to get to a doctor," said Brian. "Do leprechauns have doctors?" he asked doubtfully. "Sure, and we do!" stated the little man with assurance. "And they're as good as people doctors, too!" "How can I get you to one?" "I can't tell you that! Just leave me here. My people will come and get me. Just leave!" "Well, if you're sure you'll be all right…"
"There is a rock chimney at the far wall. You can climb out." The leprechaun seemed anxious to be rid of him, and Brian knew that his family would be waiting for him so that they could leave for the St. Patrick's Day parade; so he followed the leprechaun's directions and hurried home. The next day when Brian awoke, the first thing he saw was at the foot of his bed: a golden pot filled with gold coins! Attached to it was a note that said, "Here is the price for my freedom. I know you humans! When you captured me I knew you were after my gold, even though you said nothing. Now you'll be searching the woods, constantly hounding me until you find my gold, and I can't stand it. So here it is. I can dig another, anyway." Brian was startled. 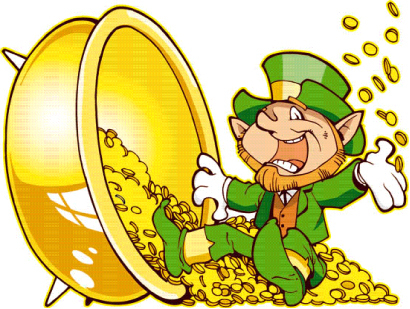 The leprechaun's pot of gold had been the thought farthest from his mind when he had helped Paddy. Obviously the little man had the wrong idea of humans. Perhaps he had met a few greedy people, and thought that they all were that way. "Oh, well," thought Brian, "his opinion is already made and I probably can't change it. I'll keep the gold. After all, he doesn't need it and we do…"
However, Brian still wasn't quite sure whether or not he should keep the gold; so he decided to hide it until such time as his mind was made up. "Mother," he asked, "if you captured a leprechaun by accident, would you keep his pot of gold?" "Really, Brian!" cried the woman, her hands full of bread dough. "Don't you think you're a little old for such things? Go and play with your sister." "All right," thought Brian, "I'll keep the gold. After all, it was his idea…"
That night, still undecided, Brian tossed and turned in his bed for nearly an hour before he finally drifted off to sleep. Even then, he got no rest. All he could think of was poor Paddy, with his broken leg, digging for another pot of gold. And, above him stood Brian, just laughing and laughing. The next morning Brian dressed and ate quickly and then hid the pot of gold in a sturdy carpetbag that his grandmother said he could have. It was very heavy, but Brian was able to leave the house and head for the rock chimney that led to the leprechaun's cave. He climbed back down and set the pot of gold on the cave floor with a note of explanation that read, "Dear Paddy: Here is the gold you gave me. I am returning it and setting you free. I had no intention of capturing you when I splinted your leg. Anyway, I don't think you should try and dig any more gold until your leg heals. I promise not to tell anyone the location of your cave. Yours, Brian O'Rourke. P.S. Take care of your leg." His conscience clear, Brian's day went by quickly, even though the landlord came by again to see if Mr. O'Rourke was having any luck raising the rent money. Brian was tempted to go back to the leprechaun cave and take the gold back anyway, before Paddy could find it; but he fought off the desire, knowing that if God wanted them to keep their home, they would find the money somehow. Brian went soundly to sleep that night, but he dreamt of leprechauns. He seemed to be at a meeting of the wee creatures—and he was the subject under discussion! "Brian O'Rourke," said a gnarled old leprechaun who appeared to be in charge, "for centuries we little people have avoided Humans because we found them all to be so disgustingly greedy—wanting our gold for material pleasures, not realizing that each of us needs his pot of gold to live. But each clan of leprechauns has one extra pot of gold, which we have saved to give to the first Human who proved himself not to be greedy, who displayed the Leprechaun qualities of selflessness and charity. You, Brian O'Rourke, in the entire history of the Leprechaun race, are the very first person to return a Wee One's pot of gold to him. "Therefore, it is my pleasure to bestow upon you our communal pot of gold—our present to you, for restoring in us some measure of faith in the Human race." Then Brian's dream was over, and he slept through the rest of the night with a smile on his face. In the morning, of course, there was no pot of gold at the foot of Brian's bed, although he did look. Brian hadn't really expected it to be there—after all, even at his age he could tell a dream from reality. But he could hear a great deal of excitement coming from the kitchen; so he dressed as quickly as he could and went down to see what was the matter. "What's going on?" he asked as soon as he entered the room. His sister and mother were laughing so loudly that he had to repeat his question so his father could hear it. "Why, only the best thing that's ever happened to us!" cried his father joyously. "The word came this morning…we've won the parish sweepstakes!" "The parish sweepstakes?!" echoed Brian. "But we didn't buy any tickets. And, besides, the drawing was held on St. Patrick's Day. Why did it take so long to hear?" "Mrs. Donnelly bought a ticket for your mother, in return for the nice things she's done for her. And it didn't take long for us to hear…considering that today is St. Patrick's Day." Brian would have been terribly confused if he had not remembered his dream of the night before—and if he had not seen the small, elfin face of Paddy the Leprechaun at the window. Paddy winked, and Brian understood.